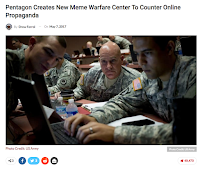 PSYOP Regimental Blog: “The Truth” – You Can Make Fun of the Truth! “The Truth” – You Can Make Fun of the Truth! With apologies to Jack Nicholson, AKA COL Jessup, USMC (see: http://bit.ly/2pyEKCd), sometimes you help people handle the truth through fiction and even satire. Duffleblog.com is in my opinion, one of the more acerbic and generally accurate satirical military sources. However, I’m often reluctant to repost or ‘Like’ their posts because candidly I think some people who are not familiar with the military will take the posting as ‘real’ rather than the satire it is. 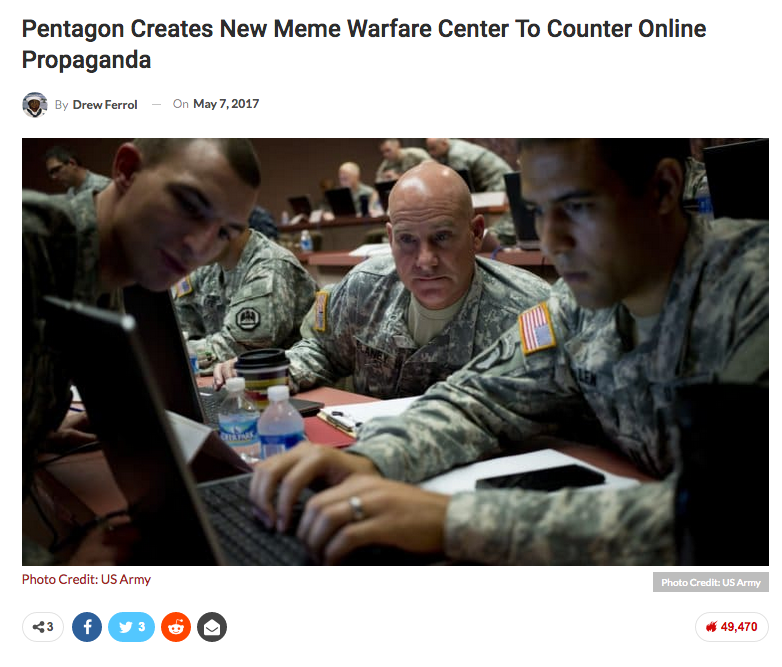 They outdid themselves with “Pentagon Creates New Meme Warfare Center to Counter Online Propaganda” (see: http://bit.ly/2qUGxXb, which is also the photo source). First of all the dateline is Fayetteville, NC the home of Fort Bragg which houses the Army Special Operations Command, parent of active duty MISO and the US Army Civil Affairs and PSYOP Command, parent of USAR PSYOP (not called MISO yet). Fittingly the lead quote contains a misnomer. It says ‘make them go virus’ instead of ‘viral’ implying that the writer doesn’t know anything about the subject matter. They proclaimed that the boss of this organization would be a 65-year-old two star (Major General). I did a bit of research and it appears that for the mandatory retirement age for General Officers is 62 (see: http://tfumux.wikia.com/wiki/Average_ages_per_rank_in_US_Military). MG Farmer has two strikes: he’s over the mandatory age and given the rest of the article – doesn’t really know very much about the Internet or popular culture. The implication may be that while DOD, and the Army in particular, may recognize that something is important and requires attention, the response isn’t always well thought out or appropriate. The point for MISO/PSYOP professionals is that you can often use fiction to do what non-fiction cannot. A prominent former White House Staffer under several Presidents once told me ‘you can say more with fiction than you can with non-fiction’. Enjoy the Food for thought. PSYActs – What you do effects your audience.